hammered piece, about 0,18 inch thick, and it features six gold feathers and an overlay design of a bear paw inside. The combined images of eagle feather and bear paw, a symbol of ultimate spiritual power, have intrigued Zhaawano for as long as he can remember. 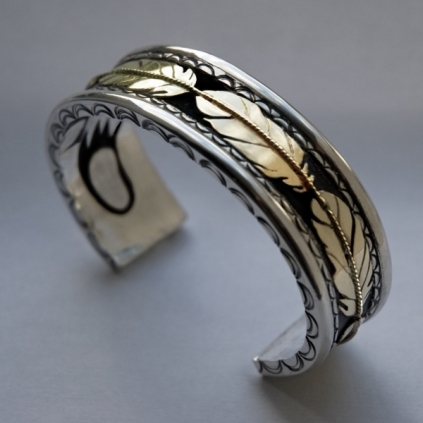 The bear paw design inside the bracelet is giimoodad or a 'hidden symbol': a stylized epitome of the notion that often what is inside a living being or a person is more beautiful than what we see on the surface. Although the gold eagle feathers on the outside of the bracelet attract the most attention, it is the bear paw in the interior that symbolizes the SOUL of the piece. It is the ESSENCE of spirit. Do u make rings like this? If so prices pics?